Home › Toys › The Giddy Kitty 5 Pack Cat Feather Toys With Small Bells And Long 33 Inch Wan.. The Giddy Kitty 5 Pack Cat Feather Toys With Small Bells And Long 33 Inch Wan.. 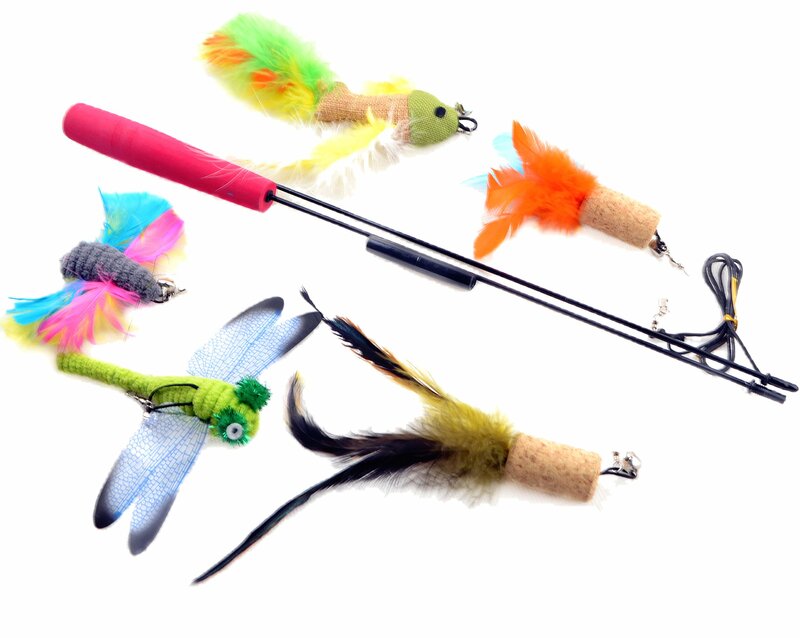 The 5 PACK VARIATION OF FEATHER TOYS OFFERS YOUR CAT DIFFERENT TOYS TO INTERACT WITH. Enjoy an unique assortment type of feather and toys each with small bell. KEEP YOUR CAT ACTIVE AND HEALTHY WHILE HAVING FUN YOURSELF. MADE FROM HIGH QUALITY MATERIALS THAT ARE CAT FRIENDLY AND NON-TOXIC. Mimics hunting natural prey for cats and kitten. On each toy includes small bell that also stimulates cats hearing while playing. MAKE YOUR MONEY COUNT WITH THIS LONG LASTING FIVE PACK. WHY KEEP BUYING REPLACEMENTS WHEN THIS PURCHASE CAN LAST FOR MONTHS. Makes for a great gift for yourself or other cat lovers. THE GIDDY KITTY PACKAGE INCLUDES: 1. Canvas Fly Fish with Yellow, Green and Orange Feathers and Small Bell 1. Green Dragonfly with Small Bell 1. Cork Screw with Yellow, Tan and Black Feathers with Small Bell 1. Cork Screw with Orange and Blue Feathers with Small Bell 1. Butterfly with Yellow, Pink and Blue Feathers and Small Bell 1. Extra Long 33 Inch Wand That Comes In Two Pieces For Easy Storage. Why keep buying replacements when you can buy a 5 pack that will last much longer than one or two pack? Keep you cat entertained with this assortment pack that will last months to come. Cats love to hunt, play and chase after this feather toy. This is a great toyfor active kittens and cats. Made from quality materials that are non-toxic toyour cat. Simple to interchange toy feathers with small clip attachment. Comeswith super long flexible 33 inch wand and strong string. Keep your cat happy, healthy and fit. Click the buy button now for areasonable priced toy for your cat.